See the image of Takayasu arteritis below. A 48-year-old woman with Takayasu disease. Note the narrowing of the origin of the right subclavian artery and a narrowed small vessel with subsequent aneurysmal dilatation on the right side. A scoring system that correlates color Doppler ultrasound with clinical activity has been described, with statistically significant results in a study of 19 patients. A correlation was also found with angiographic findings in selected arterial sites.  . Further evaluation of this tool is needed. The CT differential diagnosis includes giant cell arteritis, polyarteritis nodosa, and atherosclerosis  . One disadvantage of CT, as compared to conventional angiography, is that pressure differentials cannot be measured across lesions in which imaging findings regarding hemodynamic significance are inconclusive. Currently, MRI is one of the methods most often used to evaluate Takayasu arteritis. It offers reproducibility and excellent luminography and lacks radiation. The utility of this noninvasive technique is particularly high in pediatric patients, in whom the biological costs and complications of angiography are potentially greater than in adults. In cases of Takayasu arteritis, gadolinium-enhanced MRA may demonstrate concentric or crescent-like thickening of the arterial wall. Inversion recovery–prepared echo-gradient pulse sequences with fat suppression depict indistinct outlines. Delayed hyperenhancement is seen on delayed contrast-enhanced MRI in the inflamed aortic arterial walls. Mural thrombi can be more easily detected on MRI than on conventional angiography  . Assessment of disease activity is one of the major challenges for physicians. The soft tissue differentiation obtained with MR techniques may help distinguish the active or acute phase from the chronic phase of the disease. This capability may be important in the timing of catheter-based or other interventions. Discerning between active disease and inactive disease with fibrosis has been a matter of extensive study, as the 2 entities have similar characteristics on contrast MRI. New contrast agents that compartmentalize to the intravascular space, such as gadofosveset trisodium, may be the answer to this problem. Already approved in Europe, this contrast agent has demonstrated the capacity to make this distinction. Significant enhancement of the arterial wall was identified in active disease, whereas no such enhancement was detected in fibrotic tissue. Further studies are required before this agent can be considered for approval by the FDA. Gadolinium-based contrast agents have been linked to the development of nephrogenic systemic fibrosis (NSF) or nephrogenic fibrosing dermopathy (NFD). For more information, see Nephrogenic Fibrosing Dermopathy. Characteristic long, tapered, narrowing of the distal aorta and iliac vessels. Narrowing of the proximal descending aorta and right brachiocephalic artery. In 75% of patients, the sites of vascular involvement include the aortic arch and its branches. The most commonly involved aortic branches are the left subclavian artery, which is affected in 55% of patients, followed by the right subclavian artery (38%), the left common carotid artery (30%), and the right common carotid artery (15%). Aortography most frequently reveals focal, smooth, symmetric narrowing of the aorta and multiple branch vessel stenosis or occlusion, with secondary collateral vascularity or systemic-pulmonary shunts. Stenosis is the most common finding and tends to affect the thoracic aorta, abdominal aorta, subclavian artery, common carotid arteries, and renal arteries. Arterial dilatation and fusiform aneurysms are often found in the ascending aorta and the right-sided brachiocephalic and subclavian arteries. When Takayasu arteritis involves the subclavian artery, the lesion is a smoothly tapered stenosis; it begins within a few centimeters of the arch and extends to the origin of the vertebral artery. When the condition involves the carotid artery, regions of multisegmental dilation are alternated with regions of normal-appearing arterial wall  . Pressure measurements should be obtained in the ascending aorta and compared with measurements in the extremities. 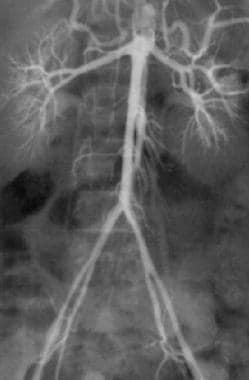 Fibromuscular dysplasia (FMD) is part of the differential diagnoses of Takayasu arteritis. Classic FMD has a beaded appearance and usually does not affect the aorta, as evidenced on angiograms. FMD is rare in the subclavian artery. Angiography has also been used in interventional radiology procedures, such as percutaneous transluminal angioplasty (PTA) in patients with quiescent disease and clinical stenosis. PTA without stent placement has demonstrated a long-term patency of 50% at 5 years. Detailed assessment, including disease activity and optimal immunomodulatory treatment, should be determined before undergoing these procedures, as restenosis is frequent in patients with active disease. Giordano JM. Takayasu's disease and temporal arteritis. Semin Vasc Surg. 1995. 8:335-41. [Medline]. Jejeda C, Correa P. Non-syphilitic aortitis. Arch Pathology. 1969. 87:177. Numano F, Okawara M, Inomata H, Kobayashi Y. Takayasu's arteritis. Lancet. 2000 Sep 16. 356(9234):1023-5. [Medline]. Cakar N, Yalcinkaya F, Duzova A, Caliskan S, Sirin A, Oner A, et al. Takayasu arteritis in children. J Rheumatol. 2008 May. 35(5):913-9. [Medline]. Chung JW, Kim HC, Choi YH, Kim SJ, Lee W, Park JH. Patterns of aortic involvement in Takayasu arteritis and its clinical implications: evaluation with spiral computed tomography angiography. J Vasc Surg. 2007 May. 45(5):906-14. [Medline]. Maksimowicz-McKinnon K, Hoffman GS. Takayasu arteritis: what is the long-term prognosis?. Rheum Dis Clin North Am. 2007 Nov. 33(4):777-86, vi. [Medline]. Mwipatayi BP, Jeffery PC, Beningfield SJ, Matley PJ, Naidoo NG, Kalla AA, et al. Takayasu arteritis: clinical features and management: report of 272 cases. ANZ J Surg. 2005 Mar. 75(3):110-7. [Medline]. Conkar S, Mir S, Sözeri B, Bulut İK, Çınar C. Evaluation and therapy in four patients with Takayasu's arteritis. Saudi J Kidney Dis Transpl. 2016 Jan. 27 (1):164-9. [Medline]. Brunner J, Feldman BM, Tyrrell PN, Kuemmerle-Deschner JB, Zimmerhackl LB, Gassner I, et al. Takayasu arteritis in children and adolescents. Rheumatology (Oxford). 2010 Oct. 49 (10):1806-14. [Medline]. Weyand CM, Goronzy JJ. Medium- and large-vessel vasculitis. N Engl J Med. 2003 Jul 10. 349 (2):160-9. [Medline]. Sharma S, Thataie D, Saxena A. Renovascular hypertension resulting from nonspecific aortoarteritis in children: midterm results of percutaneous transluminal renal angioplasty and predictors of restenosis. AJR Am J Roentgenol. 1996. 166:157-162. [Medline]. Ozen S, Duzova A, Bakkaloglu A, Bilginer Y, Cil BE, Demircin M, et al. Takayasu arteritis in children: preliminary experience with cyclophosphamide induction and corticosteroids followed by methotrexate. J Pediatr. 2007 Jan. 150(1):72-6. [Medline]. Trinidad B, Bhimji SS. Arteritis, Takayasu. 2018 Jan. [Medline]. [Full Text]. Kim ESH, Beckman J. Takayasu arteritis: challenges in diagnosis and management. Heart. 2018 Apr. 104 (7):558-565. [Medline]. Espígol-Frigolé G, Prieto-González S, Alba MA, Tavera-Bahillo I, García-Martínez A, Gilabert R, et al. Advances in the diagnosis of large vessel vasculitis. Rheum Dis Clin North Am. 2015. 41 (1):125-40, ix. [Medline]. Tombetti E, Mason JC. Application of imaging techniques for Takayasu arteritis. Presse Med. 2017 Jul - Aug. 46 (7-8 Pt 2):e215-e223. [Medline]. [Full Text]. Cantu C, Pineda C, Barinagarrementeria F. Noninvasive cerebrovascular assessment of Takayasu arteritis. Stroke. 2000. 31:2197-2202. [Medline]. Matsunaga N, Hayashi K, Sakamoto I. Takayasu arteritis: protean radiologic manifestations and diagnosis. Radiographics. 1997 May-Jun. 17(3):579-94. [Medline]. Pipitone N, Versari A, Salvarani C. Role of imaging studies in the diagnosis and follow-up of large-vessel vasculitis: an update. Rheumatology (Oxford). 2008 Apr. 47(4):403-8. [Medline]. Yamada I, Numano F, Suzuki S. Takayasu arteritis: evaluation with MR imaging. Radiology. 1993 Jul. 188(1):89-94. [Medline]. Shih G, Shih WJ, Huang WS, Milan PP. Hashimoto thyroiditis and Takayasu aortitis: visualization of the thyroid gland and ring appearance of the mediastinum on F-18-FDG PET. Clin Nucl Med. 2008 May. 33(5):377-9. [Medline]. Zeina AR, Slobodin G, Barmeir E. Takayasu's arteritis as a cause of carotidynia: clinical and imaging features. Isr Med Assoc J. 2008 Feb. 10(2):158-9. [Medline]. Mavrogeni S, Dimitroulas T, Chatziioannou SN, Kitas G. The role of multimodality imaging in the evaluation of Takayasu arteritis. Semin Arthritis Rheum. 2013 Feb. 42(4):401-12. [Medline]. Bryl M, Guzinski M, Rabczynski M, Waliszewska-Prosól M, Garcarek J, Adamiec R, et al. Imaging difficulties in Takayasu arteritis - case report and review of the literature. Pol J Radiol. 2012 Oct. 77(4):67-71. [Medline]. [Full Text]. Mavrogeni S, Dimitroulas T, Chatziioannou SN, Kitas G. The role of multimodality imaging in the evaluation of Takayasu arteritis. Semin Arthritis Rheum. 2013 Feb. 42 (4):401-12. [Medline]. Matsunaga N, Hayashi K, Sakamoto I, Ogawa Y, Matsumoto T. Takayasu arteritis: protean radiologic manifestations and diagnosis. Radiographics. 1997 May-Jun. 17 (3):579-94. [Medline]. Lee SH, Kim WH, Ko JK. 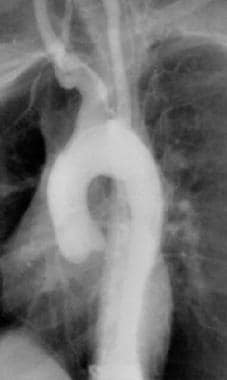 Vascular signs of Takayasu's arteritis: porcelain aorta and the 'macaroni sign'. Eur Heart J. 2014 Aug 1. 35 (29):1981. [Medline]. Fan W, Zhu J, Li J, Zhang W, Li C. Ultrasound morphological changes in the carotid wall of Takayasu's arteritis: monitor of disease progression. Int Angiol. 2016 Jan 14. [Medline]. Fan W, Zhu J, Li J, Zhang W, Li C. Ultrasound morphological changes in the carotid wall of Takayasu's arteritis: monitor of disease progression. Int Angiol. 2016 Dec. 35 (6):586-592. [Medline]. [Full Text]. Gotway MB, Araoz PA, Macedo TA, Stanson AW, Higgins CB, Ring EJ, et al. Imaging findings in Takayasu's arteritis. AJR Am J Roentgenol. 2005 Jun. 184 (6):1945-50. [Medline]. Wang J, Lee YZ, Cheng Y, Zheng Y, Gao J, Tang X, et al. Sonographic Characterization of Arterial Dissections in Takayasu Arteritis. J Ultrasound Med. 2016 Jun. 35 (6):1177-91. [Medline]. Nam SJ, Kim EK. Incidentally diagnosed Takayasu arteritis on thyroid ultrasonography showing prominent collateral vessels of thyroidal arteries and common carotid artery occlusion. Ultrasonography. 2014 Jul. 33 (3):222-5. [Medline]. Sinha D, Mondal S, Nag A, Ghosh A. Development of a colour Doppler ultrasound scoring system in patients of Takayasu's arteritis and its correlation with clinical activity score (ITAS 2010). Rheumatology (Oxford). 2013 Dec. 52 (12):2196-202. [Medline]. Magnoni M, Dagna L, Coli S, Cianflone D, Sabbadini MG, Maseri A. Assessment of Takayasu arteritis activity by carotid contrast-enhanced ultrasound. Circ Cardiovasc Imaging. 2011 Mar. 4 (2):e1-2. [Medline]. Schinkel AF, van den Oord SC, van der Steen AF, van Laar JA, Sijbrands EJ. Utility of contrast-enhanced ultrasound for the assessment of the carotid artery wall in patients with Takayasu or giant cell arteritis. Eur Heart J Cardiovasc Imaging. 2014 May. 15 (5):541-6. [Medline]. Germanò G, Macchioni P, Possemato N, Boiardi L, Nicolini A, Massimiliano Casali, et al. Contrast-enhanced ultrasound of the carotid artery in patients with large vessel vasculitis: Correlation with positron emission tomography findings. Arthritis Care Res (Hoboken). 2016 Apr 5. [Medline]. Giordana P, Baqué-Juston MC, Jeandel PY, Mondot L, Hirlemann J, Padovani B, et al. Contrast-enhanced ultrasound of carotid artery wall in Takayasu disease: first evidence of application in diagnosis and monitoring of response to treatment. Circulation. 2011 Jul 12. 124 (2):245-7. [Medline]. Herlin B, Baud JM, Chadenat ML, Pico F. Contrast-enhanced ultrasonography in Takayasu arteritis: watching and monitoring the arterial inflammation. BMJ Case Rep. 2015 Oct 9. 2015:[Medline]. Zhu FP, Luo S, Wang ZJ, Jin ZY, Zhang LJ, Lu GM. Takayasu arteritis: imaging spectrum at multidetector CT angiography. Br J Radiol. 2012 Dec. 85 (1020):e1282-92. [Medline]. Kang EJ, Kim SM, Choe YH, Lee GY, Lee KN, Kim DK. Takayasu arteritis: assessment of coronary arterial abnormalities with 128-section dual-source CT angiography of the coronary arteries and aorta. Radiology. 2014 Jan. 270 (1):74-81. [Medline]. Paul JF, Fiessinger JN, Sapoval M. Follow-up electron beam CT for the management of early phase Takayasu arteritis. J Comput Assist Tomogr. 2001. 25:924-31. [Medline]. Gupta R, Kavimandan A, Kumar R. Does PET-CT predict disease activity in Takayasu's arteritis?. Scand J Rheumatol. 2008 May-Jun. 37(3):237-9. [Medline]. John RA, Keshava SN, Danda D. Correlating MRI with clinical evaluation in the assessment of disease activity of Takayasu's arteritis. Int J Rheum Dis. 2017 Jul. 20 (7):882-886. [Medline]. [Full Text]. Desai MY, Stone JH, Foo TK, Hellmann DB, Lima JA, Bluemke DA. Delayed contrast-enhanced MRI of the aortic wall in Takayasu's arteritis: initial experience. AJR Am J Roentgenol. 2005 May. 184 (5):1427-31. [Medline]. Choe YH, Han BK, Koh EM, Kim DK, Do YS, Lee WR. Takayasu's arteritis: assessment of disease activity with contrast-enhanced MR imaging. AJR Am J Roentgenol. 2000 Aug. 175 (2):505-11. [Medline]. Papa M, De Cobelli F, Baldissera E, Dagna L, Schiani E, Sabbadini M, et al. 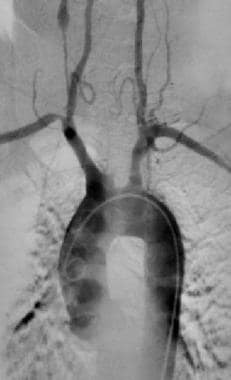 Takayasu arteritis: intravascular contrast medium for MR angiography in the evaluation of disease activity. AJR Am J Roentgenol. 2012 Mar. 198 (3):W279-84. [Medline]. Karapolat I, Kalfa M, Keser G, Yalçin M, Inal V, Kumanlioglu K, et al. Comparison of F18-FDG PET/CT findings with current clinical disease status in patients with Takayasu's arteritis. Clin Exp Rheumatol. 2013 Jan-Feb. 31(1 Suppl 75):15-21. [Medline]. Chrapko BE, Chrapko M, Nocuń A, Stefaniak B, Zubilewicz T, Drop A. Role of 18F-FDG PET/CT in the diagnosis of inflammatory and infectious vascular disease. Nucl Med Rev Cent East Eur. 2016. 19 (1):28-36. [Medline]. Lee YH, Choi SJ, Ji JD, Song GG. Diagnostic accuracy of 18F-FDG PET or PET/CT for large vessel vasculitis : A meta-analysis. Z Rheumatol. 2015 Dec 25. [Medline]. Santhosh S, Mittal BR, Gayana S, Bhattacharya A, Sharma A, Jain S. F-18 FDG PET/CT in the evaluation of Takayasu arteritis: an experience from the tropics. J Nucl Cardiol. 2014 Oct. 21 (5):993-1000. [Medline]. Comarmond C, Dessault O, Devaux JY, Costedoat-Chalumeau N, Resche-Rigon M, Isnard R, et al. Myocardial perfusion imaging in Takayasu arteritis. J Rheumatol. 2013 Dec. 40 (12):2052-60. [Medline]. Park JH, Han MC, Kim SH. Takayasu arteritis: angiographic findings and results of angioplasty. AJR Am J Roentgenol. 1989 Nov. 153(5):1069-74. [Medline]. Hata A, Noda M, Moriwaki R, Numano F. Angiographic findings of Takayasu arteritis: new classification. Int J Cardiol. 1996 Aug. 54 Suppl:S155-63. [Medline]. Kerr GS, Hallahan CW, Giordano J, Leavitt RY, Fauci AS, Rottem M, et al. Takayasu arteritis. Ann Intern Med. 1994 Jun 1. 120 (11):919-29. [Medline]. Angle JF, Nida BA, Matsumoto AH. Endovascular treatment of large vessel arteritis. Tech Vasc Interv Radiol. 2014 Dec. 17 (4):252-7. [Medline]. Choe YH, Han BK, Koh EM, Kim DK, Do YS, Lee WR. Takayasu's arteritis: assessment of disease activity with contrast-enhanced MR imaging. AJR Am J Roentgenol. 2000 Aug. 175(2):505-11. [Medline]. Flamm SD, White RD, Hoffman GS. The clinical application of 'edema-weighted' magnetic resonance imaging in the assessment of Takayasu's arteritis. Int J Cardiol. 1998 Oct 1. 66 Suppl 1:S151-9; discussion S161. [Medline]. Kumar S, Radhakrishnan S, Phadke RV, Gupta RK, Gujral R. Takayasu's arteritis: evaluation with three-dimensional time-of-flight MR angiography. Eur Radiol. 1997. 7(1):44-50. [Medline]. Yamada I, Nakagawa T, Himeno Y. Takayasu arteritis: diagnosis with breath-hold contrast-enhanced three- dimensional MR angiography. J Magn Reson Imaging. 2000. 11:481-7. [Medline]. Steeds RP, Mohiaddin R. Takayasu arteritis: role of cardiovascular magnetic imaging. Int J Cardiol. 2006 Apr 28. 109(1):1-6. [Medline]. Kato Y, Terashima M, Ohigashi H, Tezuka D, Ashikaga T, Hirao K, et al. Vessel Wall Inflammation of Takayasu Arteritis Detected by Contrast-Enhanced Magnetic Resonance Imaging: Association with Disease Distribution and Activity. PLoS One. 2015. 10 (12):e0145855. [Medline]. Barra L, Kanji T, Malette J, Pagnoux C, CanVasc. Imaging modalities for the diagnosis and disease activity assessment of Takayasu's arteritis: A systematic review and meta-analysis. Autoimmun Rev. 2018 Feb. 17 (2):175-187. [Medline]. The author thanks his wife, Florence, for her support in allowing the time to both pursue academic endeavors and complete this project.